Once apple maggots infest a tree, they can quickly ruin a crop. As their numbers grow, they can spread to nearby orchards and damage commercial crops. Apple maggots are such a serious pest in the Northwest that the Washington State University Extension discourages homeowners from planting apple trees in their backyards. If you suspect you may have an infestation, you must spray promptly. If apple maggots are a serious problem in your area, contact your local county extension office for advice on any further control methods. Hang four to five apple maggot traps in your apple trees branches beginning in late June. Hang the traps at eye level (for easy monitoring) and prune any foliage that comes within 12 inches of the traps. Monitor the apple maggot traps daily. Replace the traps every three to four weeks as the trap's adhesive wears away. 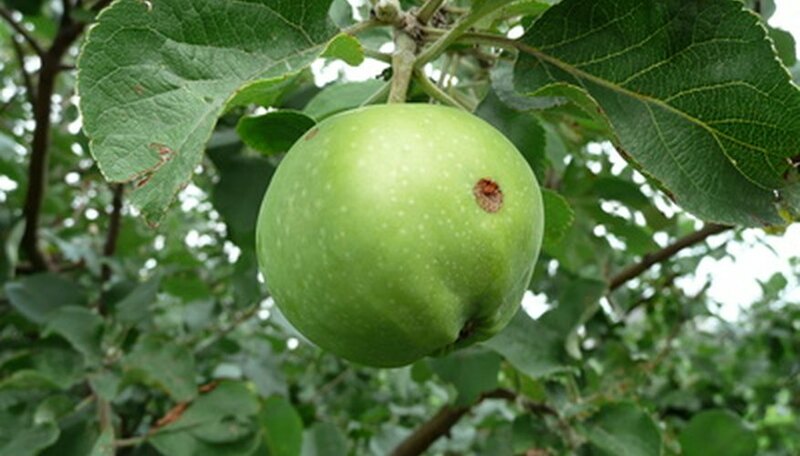 As soon as the first apple maggot fly is captured, you must spray within seven days to achieve effective control. Remove the apple maggot traps to avoid spraying them. Spray your apple tree with an insecticide manufactured for the control of apple maggots. Follow the manufacturer's instructions for application procedures and amounts. Most insecticides require you to coat the apple tree's foliage until just before or just after the point of run-off. Once you have finished spraying, replace the apple maggot traps. Respray the tree every seven to 14 days. Stop spraying when you see no more apple maggot flies caught in the traps. However, even if you continue to see apple maggot flies in the traps after repeated sprays, you must stop spraying to allow the manufacturer-dictated pre-harvest interval to elapse. Spraying after this date will render your apples inedible. Respray your apple tree after it rains even if seven to 14 days have not yet elapsed. Restart the counter after this early spray (wait seven to 14 more days before spraying again). Contact your local county extension office for suggestions for apple maggot insecticide scheduled for home use. The horticulturalists at Washington State University recommend using Kaolin clay. This spray is non-toxic and does not kill the apple maggots, but masks the apples and irritates the flies to deter them from infesting the tree. Apple maggot fly traps trap a number of different kinds of flies. Be sure you accurately identify the apple maggot fly before you spray.